Texas Gov. Greg Abbott on Monday, July 18, announced his proposed Police Protection Act, which would make it tougher on people who commit crimes against law enforcement officers. Abbott, a Republican, said the proposal comes after two high-profile attacks that targeted police officers—one that left five officers dead in Dallas earlier this month and another on Sunday in neighboring Louisiana that killed three officers. The proposal would also make it a hate crime for anyone who commits a crime against a law enforcement officer in the state out of bias against police. 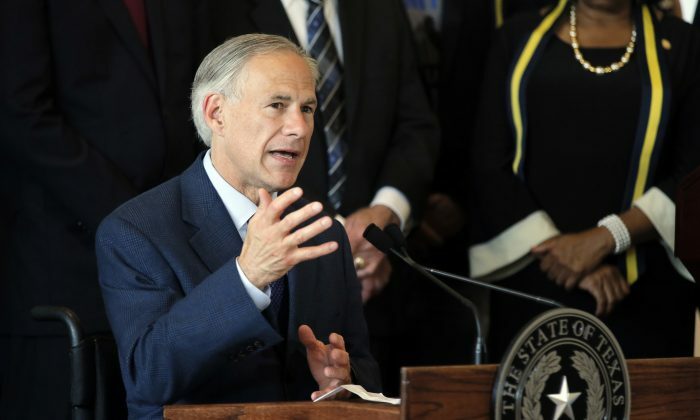 Abbott will deliver the proposal to the Texas Legislature for 2017, his office said. Following the Dallas shooting, Wisconsin became the latest state to float a so-called Blue Lives Matter bill that would make the biased targeting of police officers a hate crime. Outside of Texas and Wisconsin, at least nine other states have floated similar bills, The Associated Press reported. Under Abbott’s new proposal, it would expand hate crime protections to law enforcement officers, increase criminal penalties for crimes in which the victim is a law enforcement officer—whether it’s a hate crime or not—and will organize a campaign to educate Texans to value law enforcement. “The recent shooting in Dallas is not the first time law enforcement officers in Texas have been targeted. Our goal is to do everything possible to make it the last,” added Abbott. Currently an assault on a public servant, including law enforcement personnel, is a third-degree felony. Under the new proposal, the penalty for assaulting a law enforcement officer would increase to a second-degree felony. Law enforcement organizations welcomed the proposal.